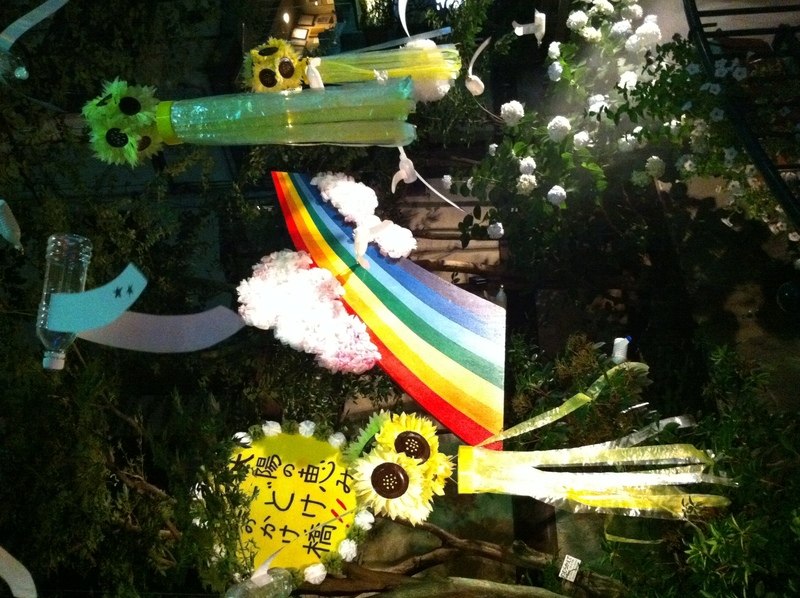 Today is Tanabata here in Japan! It is also known as the Star Festival, 七夕 or simply 7/7, and is the holiday of star-crossed lovers. It’s a bit romantic and fun, with lots of great decorations. When we did holiday presentations in class a few months ago, many of the girls chose to tell me about Orihime and Hikoboshi, represented by the stars Altair and Vega in the heavens. They are separated by the Milky Way and able to meet only once a year, on July 7th–but only if it doesn’t rain! Sadly, it was a bit cloudy and rainy, but I went down to our city’s Tanabata Festival to check it out with some friends. Things were a bit quiet but the decorations were lovely–all of downtown is decked out with streamers and stars! There were also lots of girls out in pretty yukata, the traditional summer kimono. 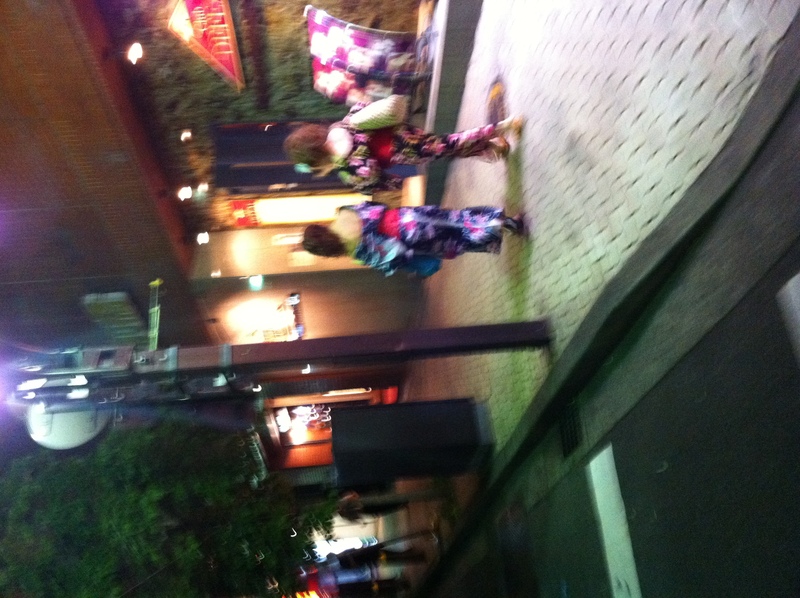 Some even wore their yukata around their shoulders–scandalous! The traditional way to celebrate is to write a wish on a slip of paper and hang it from the bamboo tree. Even the ANA counter at LAX had one set up for you to hang your wish on as I was leaving Los Angeles on Tuesday. Most of the wishes were for a safe flight, unsurprisingly! It’s a bit of a romantic holiday, so people often wish for luck in love, but other subjects are fair game as well. 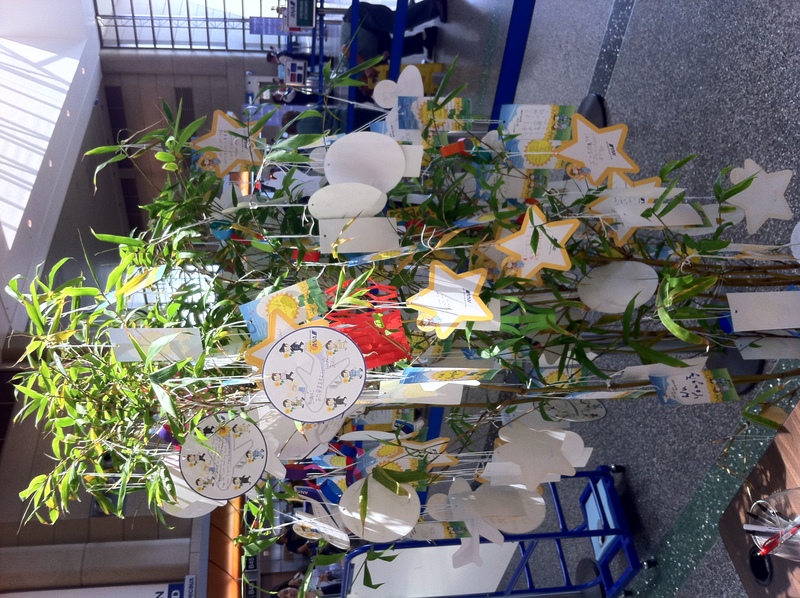 What’s your Tanabata wish? This entry was posted in Japan, Modern Traditions and tagged culture, festival, matsuri, star festival, Tanabata. Bookmark the permalink. 3 Responses to Happy Tanabata! I’m going out to Hiratsuka on Sunday to see their festival! Kinda jazzed about that. It was only cloudy here, so hopefully the lovers met~!